I looked at him and just laughed as I handed him his plate with chicken draped across the pasta. There’s no slipping anything past that husband of mine. He even made his first ever (I believe) blog comment on Monday’s Meatless Monday post to announce that we did not eat meatless on Monday, but instead…chicken. Meaty Monday! 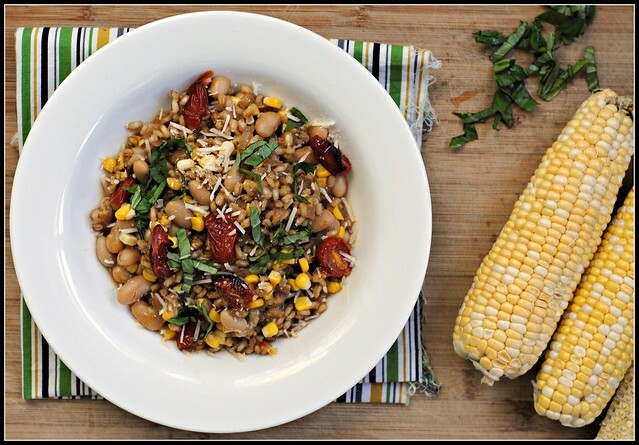 When my in-laws were in town a few weeks ago I had everything on hand to make this Summer Barley Risotto. They were going to opt for Subway to keep me out of the kitchen, but I kindly reminded them that I LOVE being in the kitchen…so long as I have happy mouths to feed. 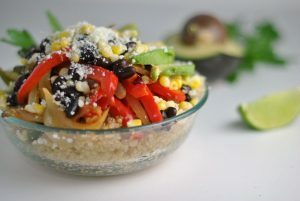 I do have a Julie Child quote framed in my kitchen, “People who love to eat are always the best people.” So true, especially when they like healthy food and trying new things. Anyways, my father-in-law is a deer hunter and loves his meat so I hesitated making this meal. I knew he would be the hardest to win over with a meatless meal. I whipped up this risotto with all of summer’s best. The cherry tomatoes this year…heavenly. He dug in…and liked it. A lot. Score 1 for the home team. That Meatless Sunday negates my failed Meatless Monday, right? 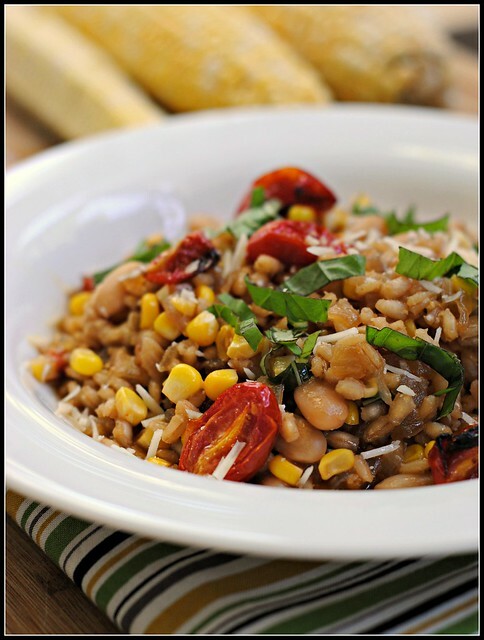 Summer Barley Risotto adapted from Honest Cooking by Elly Says Opa! Toss the tomatoes with 1 tablespoon olive oil and spread them evenly on a rimmed baking sheet. Roast, stirring 1-2 times, for about 25 minutes or until shriveled. Meanwhile, place the broth in a saucepan and bring to a simmer. Reduce the heat to low to keep hot but not boiling. In a large skillet with deep sides, heat the remaining tablespoon oil over medium heat. Add the onion and cook, stirring, until it softens, about 5 minutes. Stir in the garlic and the barley. Continue to cook, stirring to be sure all the barley is coated in the oil, for 3-5 minutes. Add the wine and cook, stirring and scraping to release anything from the bottom of the pan, until nearly all absorbed. Add 1-2 ladles full of stock to the pan and continue stirring, until the stock is nearly all absorbed. Continue cooking the barley this way, adding the stock a bit at a time and stirring frequently, until the barley is tender enough to eat but still has a slight chew, about 40-50 minutes. A few minutes before it’s done, add the beans. 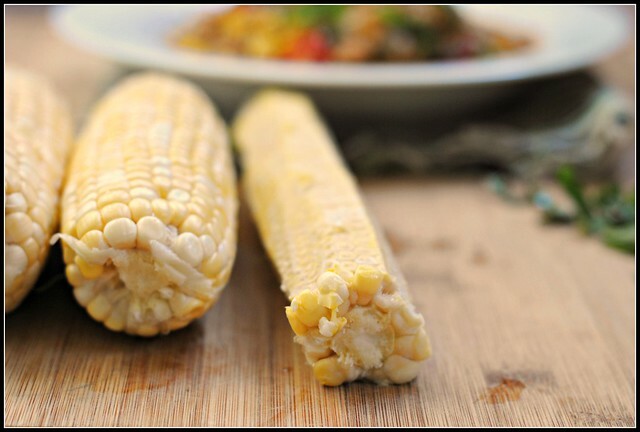 Once the barley is cooked properly, add the sweet corn and continue cooking for a 1-2 minutes, just until the corn is heated through. Remove the skillet from the heat, and stir in the butter, cheese, about half the basil, and about half the roasted tomatoes. Season to taste with salt and pepper. Plate the risotto, and top with the remaining roasted tomatoes and basil. Serve immediately. Result: The flavors and textures in this are truly unique. Nothing against my arborio rice, the traditional choice for risotto, but using barley adds a new twist with much more nutritional punch. 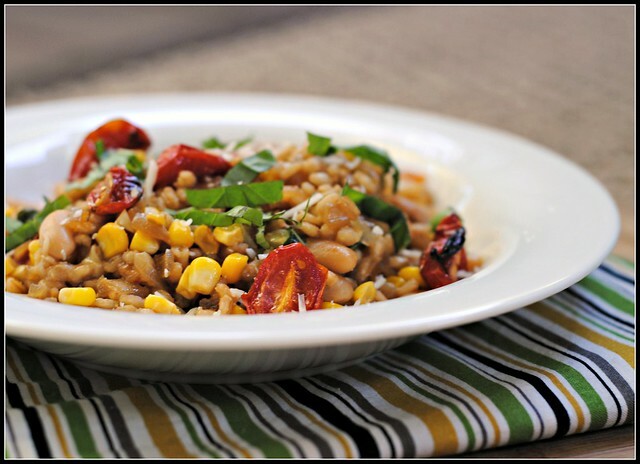 The wine, tomatoes, and corn make this dish. 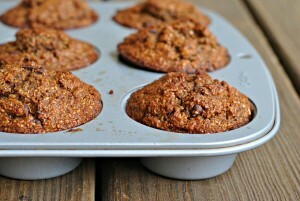 Offering up 13.2 grams of fiber per serving, this offers a lot of staying power. Modest in sodium, too! Enjoy! haha, I can just hear Mark saying that to you! I’m glad he’s embraced the blog now, or at least it sounds like it. I can’t wait to see pics of the winery tour! I love winery tours. Matt and I go all the time because we have quite a few wineries near us. i know that there are a lot down in Southern MI too, but I’ve never tried any of them. I’m always skeptical about people’s reactions when serving them food. Unless its my husband or immediate family I assume that they’re just being nice when they say that they like something. Dinner guests can’t be trusted. bahahaha… I love that he even noticed! I feel like most guys I date/are friends with are like “ooohhh fooooood” with no regard to what day it is. The risotto looks & sounds wonderful! Gotta love Mr. P busting you about meatless Monday!! That is too funny that you have that quote in your kitchen..I do too!! Great minds (and cooks!) think alike. A winery tour sounds like fun! I think this week is dragging because next week I’m on vacation! I don’t think my husband would notice any household food trends. I read this post on my phone earlier and couldn’t comment from there, but I am online now with some time to spare. So funny that your husband called you out on this one, but I agree if you did it Sunday, it can displace or replace Monday. This risotto looks awesome. And it is awesome that your father in law was a fan.